We recommend checking out our discussion threads on the Focusrite Control 2802 - Analog Mixer CONTROL 2802, which address similar problems with connecting and setting up Audio Interfaces & Systems Focusrite. The user manual for the Focusrite Control 2802 - Analog Mixer CONTROL 2802 provides necessary instructions for the proper use of the product Pro Audio - Computer Audio - Audio Interfaces & Systems. The Focusrite Control 2802 is a dual-layer, small-format console that is both an analog mixer and a DAW controller in one unit. The device lets you easily switch back and forth between the two layers, giving you flexibility to control your DAW and mix analog sources. The mixer portion of the Control 2802 contains 8 channels, all equipped with transparent Class-A Focusrite mic preamps. Each of the 8 channel strips is equipped with numerous controls, including switchable 48V phantom power, polarity reverse, mic gain (+6 to 60 dB), a 75 Hz high-pass filter, knobs for the cue pan and level, 2 aux sends, a pan control, a channel mix bus assign button, and more. 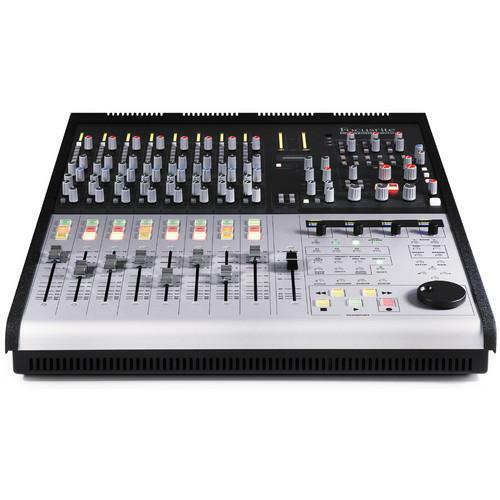 Each channel has a 100mm motorized fader that can be automated in either the analog or digital layer of the mixer (the Master Fader is manual). At the top of every channel strip is a 10-segment LED bar graph meter, which shows level and peak detection, and has a separate LED to indicate overloads. The analog I/O is comprehensive. In addition to the mic inputs, there are 8 balanced line inputs, 8 balanced DAW inputs, and 8 assignable direct outputs, both on a DB25 connector. You also get inserts, aux sends, compressor in/out, and more. The Control 2802 also functions as a summing mixer, allowing you to run your digital DAW tracks through analog circuitry. There's even a 3.5 mm iJack input with its own gain control, for listening to audio from your portable music device. The mixer has fully realized master section that includes a stereo mix-bus compressor with parallel compression. The punchy-sounding compressor can also be patched across other channels on the Control 2802. The monitoring section is stocked with controls, including a source control (choose between five different sources), headphone output control, on/off and level for the built-in talkback mic, and a lot more. The Ethernet-based control layer is equipped with a jog/shuttle wheel, transport controls, a large number of function buttons, and 4 high-resolution OLED displays. It supports the HUI protocol, and also carries MIDI control data through the Ethernet cable. You can work independently within either the analog or digital layer, or switch back and forth. The control surface gives you tactile control of many of the functions of your DAW, and even lets you control plug-in parameters. The controller functions are fully supported in Apple Logic, Avid Pro Tools, and Steinberg Cubase and Nuendo. Along with the mixer, Focusrite includes its Midnight Plug-In Suite, which features compressor and EQ plug-ins modeled from Focusrite's classic ISA 110 and 130 units. If you own a Focusrite audio interfaces & systems and have a user manual in electronic form, you can upload it to this website using the link on the right side of the screen. Box Dimensions (LxWxH) 28.0 x 24.5 x 12.6"
The user manual for the Focusrite Control 2802 - Analog Mixer CONTROL 2802 can be downloaded in .pdf format if it did not come with your new audio interfaces & systems, although the seller is required to supply one. It is also quite common that customers throw out the user manual with the box, or put the CD away somewhere and then can’t find it. That’s why we and other Focusrite users keep a unique electronic library for Focusrite audio interfaces & systemss, where you can use our link to download the user manual for the Focusrite Control 2802 - Analog Mixer CONTROL 2802. The user manual lists all of the functions of the Focusrite Control 2802 - Analog Mixer CONTROL 2802, all the basic and advanced features and tells you how to use the audio interfaces & systems. The manual also provides troubleshooting for common problems. Even greater detail is provided by the service manual, which is not typically shipped with the product, but which can often be downloaded from Focusrite service. If you want to help expand our database, you can upload a link to this website to download a user manual or service manual, ideally in .pdf format. These pages are created by you – users of the Focusrite Control 2802 - Analog Mixer CONTROL 2802. User manuals are also available on the Focusrite website under Pro Audio - Computer Audio - Audio Interfaces & Systems.